Miami Trace’s Devin Riggs serves during his second singles match against Jackson Monday, April 8, 2019 at Miami Trace High School. 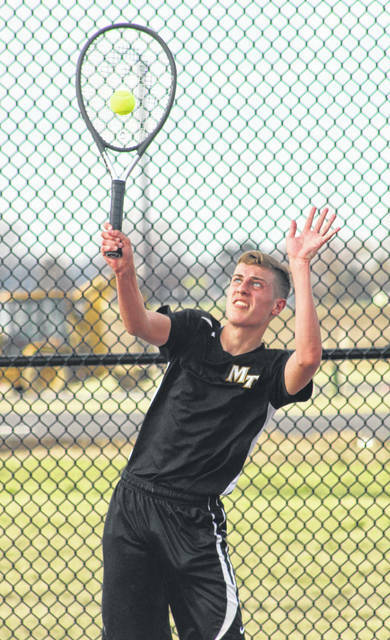 The Miami Trace tennis team hosted Jackson Monday in a match previously postponed earlier in the season. Miami Trace won the Frontier Athletic Conference match, three courts to two. At first singles, Isaac Abare lost to Mason Sheets, 4-6, 7-5, 5-7. At second singles, Devin Riggs defeated Carson Strange, 6-4, 6-4. At third singles, Jack Ivers lost, 6-3, 5-7, 1-6 (the Jackson player was not listed in the report). At first doubles, Rylan Gardner and Caleb Perry beat Raymond Armstrong and Joe Crabtree, 6-1, 6-2. At second doubles, Jake Harris and Kody Burns defeated Trent Wolford and Patrick Henry, 7-6 (7-4), 6-4. In one j-v match, the Panthers’ Sebastian Gurruchaga and Brayden Jackson won, 9-7. Miami Trace will host another FAC match, this one against the Blue Lions of Washington High School, Tuesday at 4:30 p.m.
https://www.recordherald.com/wp-content/uploads/sites/27/2019/04/web1_Devin-Riggs-MT-10us-4-8-2019.jpgMiami Trace’s Devin Riggs serves during his second singles match against Jackson Monday, April 8, 2019 at Miami Trace High School.